To paraphrase the Bible wildly out of context with tongue firmly in cheek, "Greater love has no quilter than to make a rival team quilt for a friend." 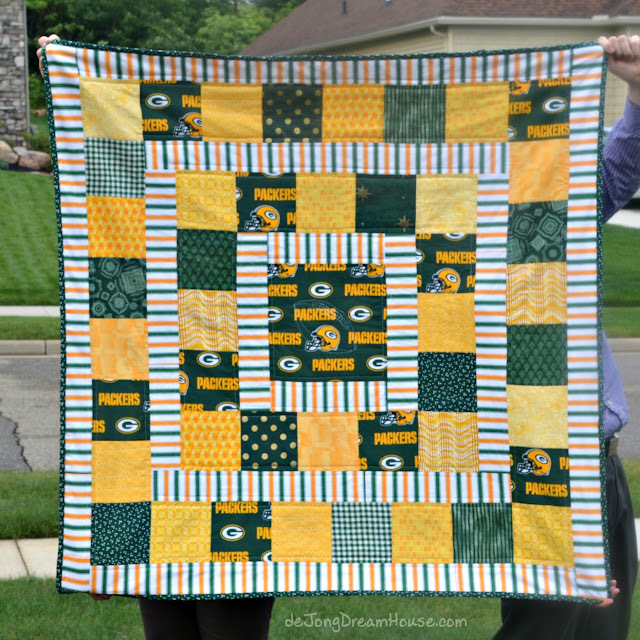 In honor of the Minnesota Viking-Green Bay Packer football game coming up, I'm sharing another one of my quilts from 2014. 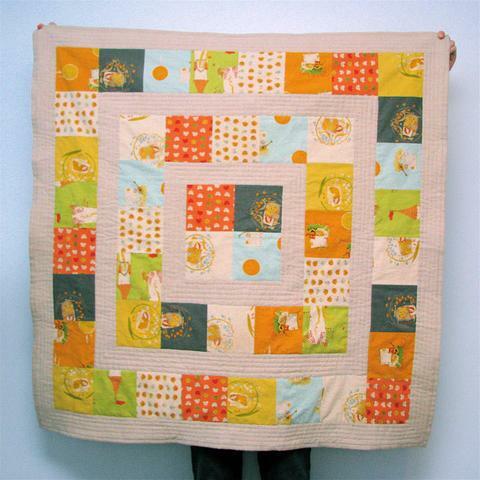 This quilt was made for a sweet baby born to my friends Mark and Anissa Meyer. Mark and I became friends when we were both in our early 20s, when I was living in Wisconsin. We had a lot of fun together with our group of friends: game nights, lots of sand volleyball, camping, church activities, going to concerts, and watching loads of football. Even though I remained true to my Minnesota Vikings, I have to admit, it was fun to watch the hometown-owned Green Bay Packers. Mark has a wonderful family, and over the years, I also became friends with his sisters and got to know and admire his parents. I interviewed them and wrote about them in my book, Generation Ex. They have influenced me in many subtle ways, but one tangible imprint on my life is the wall full of photos. 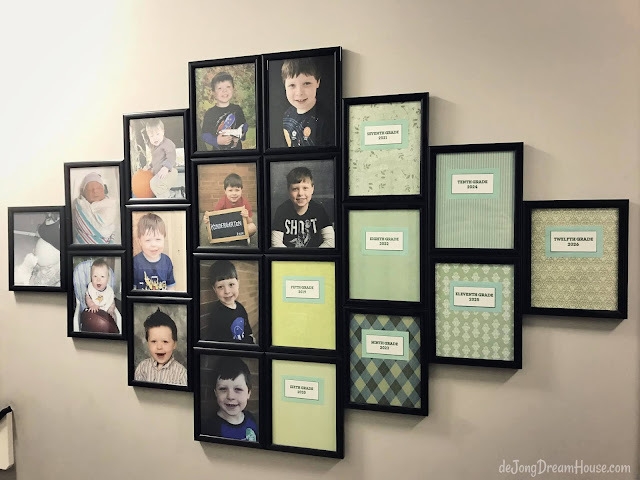 Every time I visited them, I would look over the photos hanging in chronological order along the hallway. It was such a vivid expression of family to me that it inspired the anniversary wall, "we do" gallery, and growing up gallery, displayed in our home hangs in our home. I love the visual representation of my own family history. Mark and I lived in the same area for only a few years, but our paths continued to cross over the years. We reconnected again shortly before Niels and I got married, and in true Meyer fashion, Mark drove from Wisconsin to Ohio to not only attend our wedding, but helped out behind the scenes to make sure our day was perfect. Much of our friendship revolves around football banter. Since Mark's birthday is in early September, the start of the NFL season always makes me think of Mark and that fun season of our lives. When we visited Mark on our way to Minnesota when D was a baby, Mark played host to our family. 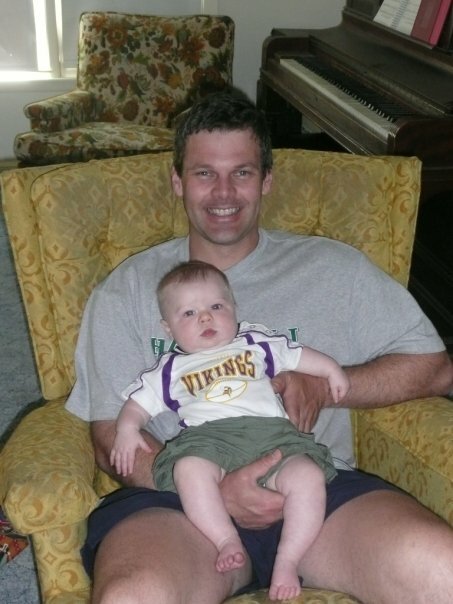 Of course, I only dressed D in Viking apparel that day. 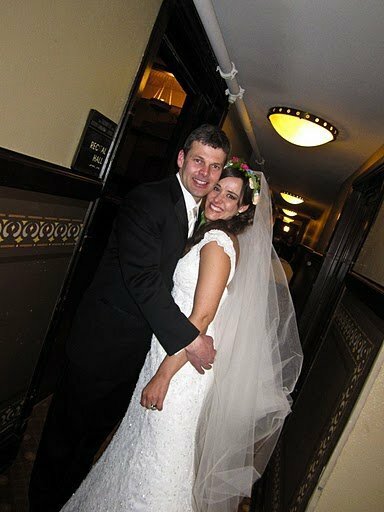 Niels and I were thrilled for Mark when he married Anissa and made the trip to Iowa to attend their nuptials. We are so happy that he found some as wonderful as he is. The pattern is Storytime Squares Quilt by Made By Rae. She was kind enough to offer the pattern for free on her site. It is a great choice for using larger blocks and coordinating prints. I had a bit of Packer fabric and green and gold prints leftover from my brother and sister-in-law's house divided quilt, which made it really easy to get started. I bought a football stencil for the center square. It was my first time trying any quilting that was not straight-line,. It's been four years, and I haven't tried it again! I used a striped minky for the back and kept the rest of the quilting simple. My favorite part of making this quilt is the label. My favorite picture of this quilt came from Anissa, who sent me this adorable photo of Abrahm on his quilt. What a cutie! Toally worth working with Packer prints to see a photo like this! 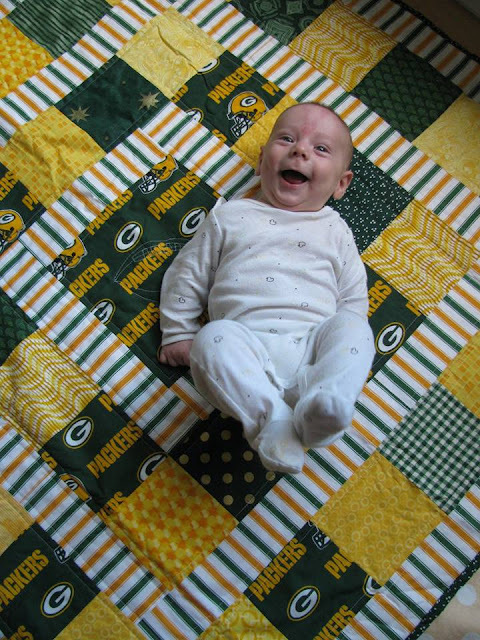 That sweet baby is now four, and I now have only four more quilts from 2014 to share! Unfortunately, I was just as much of a blogging slacker in 2015, and have only wrote about four of the sixteen quilts I made that year. I see that my throw back quilt posts will continue for quite awhile. I'm so relieved I got my stuff together in 2016! I've only missed posting about 3 of the 17 quilts I made. You can see a list of all the quilts I've made here (with links where available), and see photos of all my quilts here. To see what I'm currently working on, follow me at dejongdreamhouse on Instagram. Great quilt! That may be the most adorable baby photo ever! That quilt is the mark of true friendship!! It's always a challenge to work in an opposing team's colors, isn't it? LOL! Love the quilted football in the center. What a sweet little baby. Looks like he loves the quilt too! Oh how adorable!! And yes, I am sure you got extra brownie points in heaven for working with Samaritan fabric -- I mean PACKERS fabric -- since you're a fan of the Vikings! And I know all about that since we're from Minnesota originally and my dad was a die-hard Vikings fan, even when he got mad at them and called them the "Viqueens." Hah! Great quilt, and a great story too! Love the photo of Abrahm on his quilt. So adorable! 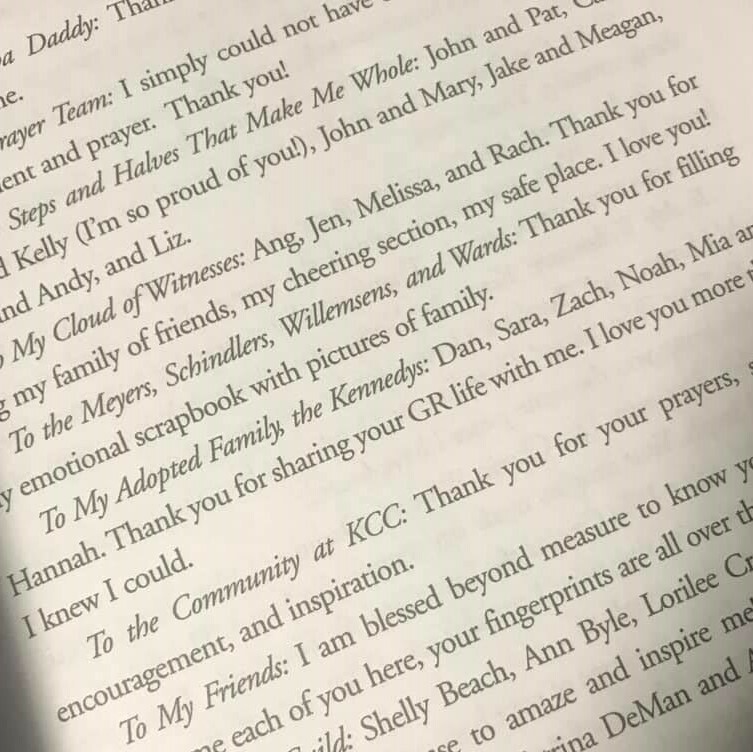 Thanks for sharing this on Wednesday Wait Loss.